If you’re looking to buy a new home anytime soon, getting your finances in order is an excellent first step to getting the keys to your dream property. No matter where you want to buy a home, your financial picture is the most critical aspect of buying a home. Read on for some tips to get you financially prepared to buy a house. Buying a property will require a significant amount of money up front. From closing costs to the down payment, you need to set a specific amount to save up before you even get out on the house hunt. Break your savings goal down by month over a yearly number if you have multiple years before you buy. If you don’t see it, you won’t spend it. Tuck all of your savings in one account. Use automatic transfers to make saving from your paycheck easier and seamless. Before you even check your account, you’re on your way to your savings goals. You may not want to keep your money in higher yield accounts. These may not allow you to take the money out when you need it. Take the time to shop interest rates on savings accounts at different banks. Some may even offer a bonus. Just remember always to pay yourself first. Don’t be tempted to spend the money that you have saved. Depending on the amount that you want to save to buy a home, you may need to cut costs significantly. Take the time to do a budget and see where you may be able to cut down on costs. Should you cut the cord on cable? Are you going out to restaurants too often? Another idea is to call your phone company and other utility providers and ask about discounts. You may need to make some lifestyle and budgeting adjustments in order to get on your way to your dream home. Did you get a big Christmas bonus from work? Did a relative give you a monetary gift for your birthday? Take all of the extra cash and stash it away in the account that’s dedicated to your home savings. It will only help you to achieve your goals faster. Before your loan can close and the keys to your dream home are yours, you’ll need to make sure you don’t make any significant purchases. You need a paper trail for all of your money. Before you buy a home is not the time to go nuts and buy furniture or buy a car. These things can affect both your credit and debt-to-income-ratio. 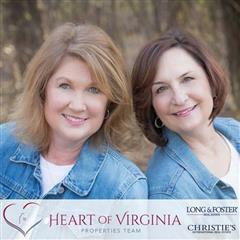 Tammy and Christy are Fredericksburg natives with strong community ties and family values. With 20 plus years’ experience in organizing, nurturing, multitasking, and problem-solving, they find themselves capable of juggling the many hats necessary for a real estate transaction. Most people look for one agent to help them manage the process but with Tammy and Christy, your clients will receive the benefit of 2 working on their behalf. They would love to welcome your referrals into the family. The data relating to real estate for sale on this website appears in part through the BRIGHT Internet Data Exchange program, a voluntary cooperative exchange of property listing data between licensed real estate brokerage firms in which Long & Foster Real Estate, Inc. participates, and is provided by BRIGHT through a licensing agreement. Information Deemed Reliable But Not Guaranteed. The information provided by this website is for the personal, non-commercial use of consumers and may not be used for any purpose other than to identify prospective properties consumers may be interested in purchasing. Copyright© 2019, BRIGHT, All Rights Reserved. Information last updated as of 04/19/2019 03:01 AM.